This year the rates in the book include contractor's overheads and profit, making the book easier for design and planning professionals. 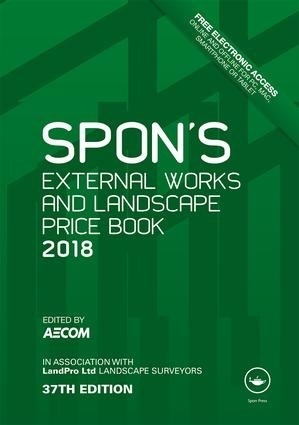 Now in its 37th edition, Spon's External Works and Landscape Price Book 2018 offers the only comprehensive source of information for detailed external works and landscape costs. It covers all the items to be found in hard and soft landscape contracts, and forms an indispensable reference book for quantity surveyors, landscape architects, contractors and local authority managers - essential for compiling estimates, specifications, bills of quantities and works schedules - no matter what the size of the project being undertaken. Use the access code inside the front cover of the book to get set up with a VitalSource(R) ebook of this 2018 edition. This versatile and powerful online data viewing package is available for use until the end of December 2018. - Material and measured work prices covering contract items from preliminaries and site clearance and encompassing the core external works activities with full breakdowns into labour, materials and other components. - Updated, free of charge, two or three times a year - see inside for registration details.